I don’t know about you, but I like my wine in a box. 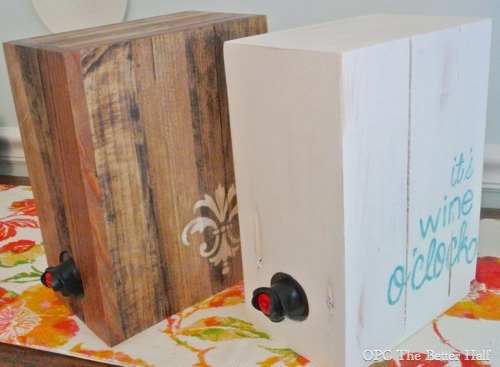 I like it even better when it has a pretty DIY wine box to help class-it-up on my counter. Can I get an “amen!” I realize boxed wine is for the lushes, or maybe just us cheap-skates, but I love me some boxed wine. Ethan came up with this idea after several parties when I poured boxed wine into a glass carafe to hide the cheap, gaudy nature of my wine. This idea was the birth of a whole new love and appreciation for Ethan! 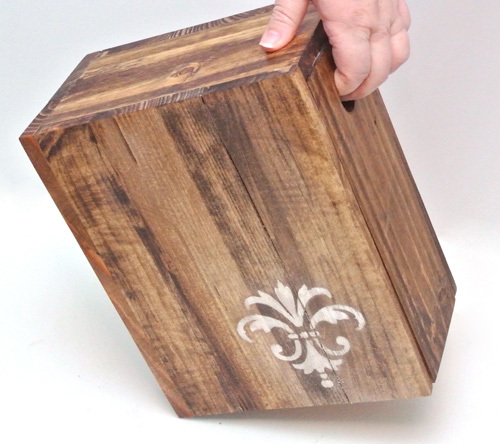 The first boxed wine holder Ethan made was using pallet wood and I stained and stenciled it afterwards. 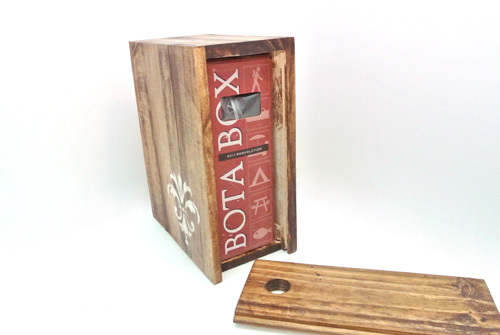 Ethan was kind enough to make a second boxed wine holder so I could have a set….just kidding! Ethan made a second boxed wine holder to GIVE AWAY!!! That means this summer, you can be sipping on some boxed wine housed by a custom-built boxed wine holder made with love by Jocie and Ethan (that’s us, lol). In case you don’t win the boxed wine holder (details at the end of the article), be sure to hope on over to OPC to read how Ethan made our DIY Wine Box! 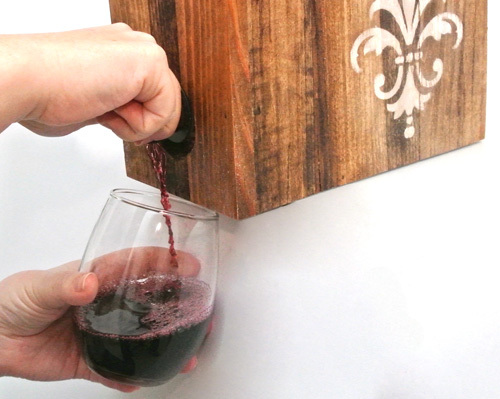 Our first boxed wine holder was made using harvested the pallet wood that was heat-treated (not chemically treated), clean and in good condition. Obviously, I avoided using pallets that may have come in contact with chemicals or other nastiness, because who wants that in their wine?! This holder I stained and then stenciled to make it a bit fancier (if you can call a boxed wine holder fancy). Both holders also have a hole in the back panel that lines up with the hole in the box, so that you can still carry your holder from place to place. 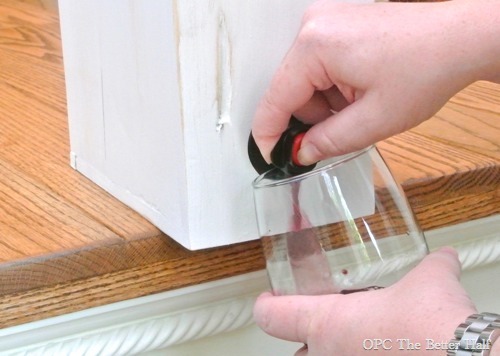 The exterior hole also helps to slide the panel up and down to replace the boxed wine. 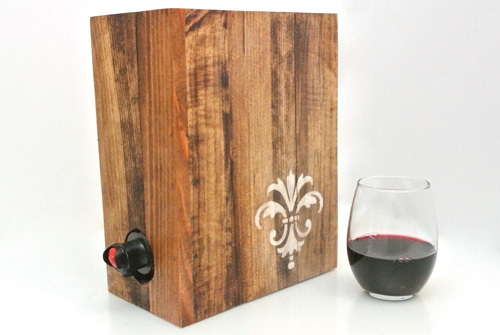 The second boxed wine holder was made using pallet wood and a little scrap Ethan had around the shop. 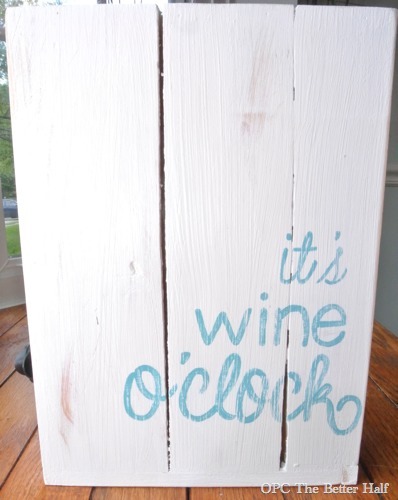 Then I painted it white and hand-painted the saying “It’s wine o’clock.” I also painted the insides of the holes aqua to give it a little peek-a-boo color. I love when I take pictures in the middle of the day that involve wine. Yes, please! 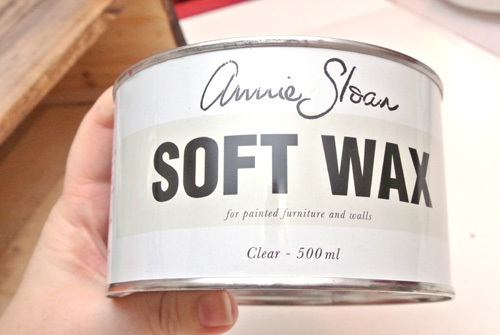 I finished it off with some clear wax to protect it from wine drips, you know, in case things get crazy! ** Updated May 20, 2013: We gave away this fabulous boxed wine holder and the winner was chosen at random by rafflecopter: Jen P! Thanks so much to all who entered! Thanks so much for entering to wine your very own DIY boxed wine holder and we hope to see you back soon. Have you ever tried the Black Box wines? Those are awesome…particularly the Malbec. Highly recommended. I love this. What a great wedding gift this would make. Love this! Perfect for serving wine at parties! Absolutely LOVE love love this!! That is fantastic… I haven’t bought a box in a while, but I might have to do it this summer! I’ve never bought wine in a box, but this is a fabulous way to serve it. I’ll have to try some for our next party. 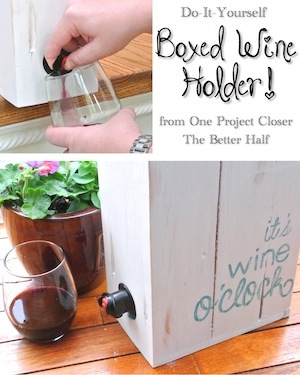 I love the wine box idea! It classes it up so much. I myself haven’t actually had boxed wine. I know, what am I waiting for, right?! Ha!